Purpose: To defeat Centurions following Ravenous and serving corruption. (Annihilation#2 (fb) - BTS / Annihilation#2: Centurions profile) - The Centurions were formed as an elite warrior force for Annihilus, one each from the 100 Negative Zone worlds under Annihilus' control. 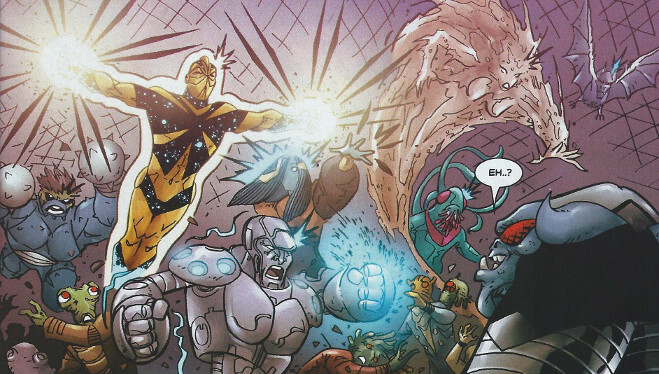 (Annihilation: Heralds of Galactus#2 (fb) - BTS) - The Centurions were only keepers of order in chaotic realms. 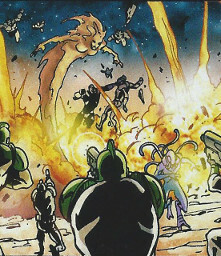 (Official Handbook of the Marvel Universe A to Z hardcover#2: Centurions profile) - Annihilus duped the Centurions into aiding his Annihilation Wave by telling them that the positive universe was destroying the Negative Zone (which was partially true, but was taking place at a slow rate and would threaten the Negative Zone in a far distant future). Misled by their own zealotry and by their blind obedience to Annihilus, whose agenda was purely for his own benefit, the Centurions followed Annihilus. 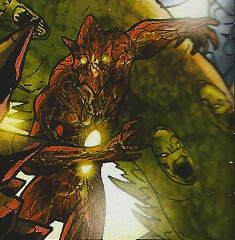 (Annihilation#2 - BTS / Annihilation#3 - BTS) - Annihilus deployed the assembled Centurions as a united strike team against the main force of heroes -- including Drax the Destroyer, Gamora, Nova (Richard Rider), Praxagora, Peter Quill, Ronan the Accuser, former heralds of Galactus Red Shift and Stardust, among others -- opposing him on Daedalus 5, a system on the periphery of the Kree Empire. Led by Hybalea, the Centurions assault broke the back of the resisting forces, effectively ending the military phase of the war. (Annihilation: Heralds of Galactus#2 (fb) - BTS) - Hybalea brought his renegade Centurions to Ominus Prime to take down Smyt, the Centurion ruling there. (Annihilation: Heralds of Galactus#2 (fb) - BTS) - A Centurion Death Squad was sent to Ominus Prime at the time of a reception being held in Smyt's honor. 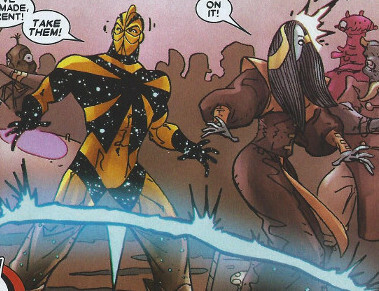 (Annihilation: Heralds of Galactus#2) - The renegade Centurions attended the reception in disguise, but Hybalea and Torrent were detected and exposed by a member of the Death Squad. Hybalea ordered the renegades to take their attackers, and the renegades dropped their holographic forms and converged on Smyt and the Death Squad. 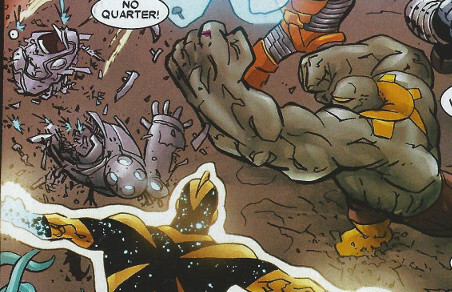 Hybalea grappled with Smyt, refusing his instruction to surrender; but when Torrent dropped after taking several blasts, Hybalea was distracted, and Smyt smashed him away with an energy fist that partially shattered his helmet. The conflict was then interrupted by Firelord, who had vowed to liberate the planets under Centurions' rule. When Smyt defied Firelord's order to surrender or die, Hybalea tried to convince Smyt and the rest of the Centurions (including the Death Squad) to surrender if they valued their lives. Smyt then struck down Hybalea with a blast from behind, and Firelord engaged the Death Squad and Smyt, transported the innocents of Omina Prime out of the reception hall, and then released an energy burst the blew the hall apart and floored those present. After Smyt continued with defiant threats, Firelord apparently slew Smyt and the rest of the Death Squad. Hybalea explained that the renegade Centurions opposed those Centurions allied with Ravenous. He continued to explain that they were hunting down their former brethren to right their wrongs, and that they did so out of shame, rather than out of anger, retribution, or atonement. He petitioned Firelord not to slay them for trying to honor their past roles. Firelord agreed, but told them he would be watching them and that if they moved against any but their brethren that he would hunt them to the ends of the universe and see them dead. Hybalea acknowledged this, and Firelord left them in peace. As far as I can tell, we don't see Torrent in Annihilation#2 (or any of the other Annihilation issues). Nor do we see the little bat-like creature (there's someone a bit similar, but it seems to be a bird-person, with feathered wings, a beak, and more humanoid legs), nor the guy with the mace-fists. 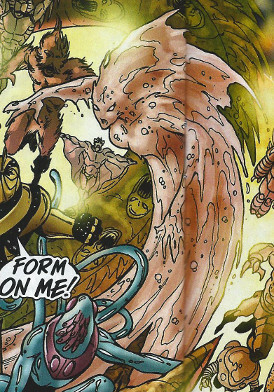 Several of the future renegades, including Hybalea, as well as the unidentified liquid woman, the robotic guy, the energized guy, and the tentacled character, are shown in the main image from the Centurions profile from Annihilation#2. Also shown in that picture is a warrior female who REALLY looks like she's from Birj (Terrax's world) and the giant spikey-rock guy. 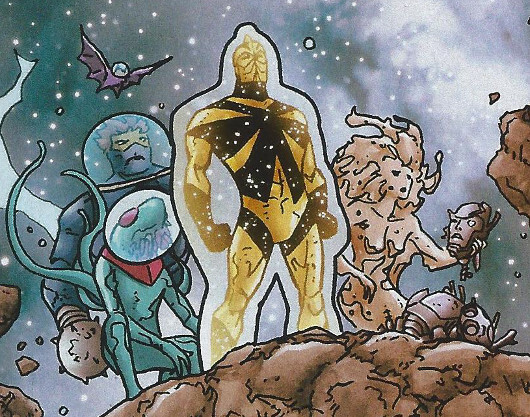 The Centurions are supposed to be composed of one member each from the 100 Negative Zone worlds under Annihilus' control. 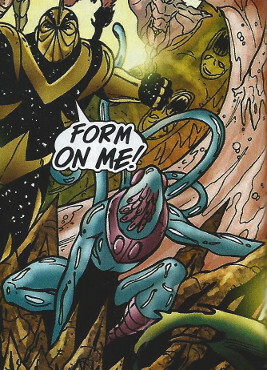 In that case, there may be a race of beings like Hybalea (presumably lacking his powers, or at least his level of power), unless they were amongst those destroyed by Annihilus for refusing to participate in the Annihilation Wave. Torrent (Espia) and the energized renegade were apparently slain, and the robotic guy shattered (and possibly repairable) but the other five should still be around. No reason they can't all be fleshed out and given names, back histories, abilities, etc. At some point she joined Hybalea's renegades who broke away from Ravenous, and after Ravenous' death squads had killed 3 other Centurions, they decided to strike back against their attackers. Torrent and Hybalea were wandering the Smyt's reception incogntio when they were detected and exposed by a member of the Death Squad. Hybalea ordered the renegades to take their attackers, and the renegades dropped their holographic forms and converged on Smyt and the Death Squad. Torrent was struck by a number of blasts and apparently died, and Hybalea was sufficiently distracted by this that Smyt was able to punch him away and shatter his helmet. Under unspecified circumstances, she could generate a holographic disguise, although it was insufficient to escape detection by the means available to the Centurion Death Squad. Perhaps Espia mentally cloaked herself and the other Centurions. Note: Although presumably present in the assault on Daedalus 5 against the United Front, I could not locate/identify Torrent. It might be inferred from his tearful reaction to Torrent's apparent death that the two were more than just teammates; but, he could have just been supremely loyal to his friends and teammates, and her apparent death could have rocked his world, especially because it may have caused him to feel he was going to fail in his goal of stopping his corrupt former brethen. This character didn't do too much...but just flap around the periphery of scenes. It presumably has some degree of offensive powers and was involved in the battle against the death squad...we just didn't see it. Following Smyt and the Death Squad's apparent deaths, the creature is seen in space (see the main image) and looks to be wearing some sort of space helmet, perhaps indicating that it required an atmosphere to breathe, but could otherwise survive in the frigid vacuum of space. Note: Although presumably present in the assault on Daedalus 5 against the United Front, I could not locate/identify this creature. This character was present during the initial attack against the United Front on Daedalus 5. At some point he joined Hybalea's renegades who broke away from Ravenous, and after Ravenous' death squads had killed 3 other Centurions, they decided to strike back against their attackers. After the renegades were exposed while infiltrating Smyt's reception, he assaulted Smyt directly, delivering a charge of energy into his head intended to kill him, and announcing how his death would show that Centurion honor endured. However, although initally pained, Smyt turned back on the energy creature and released energy from his hands that apparently incinerated the energy being. The creature could unleash energy of an undetermined nature, apparently affecting body and/or mind. Although glowing with energy, he had a physical form that could be destroyed. 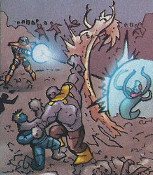 After the renegades were exposed while infiltrating Smyt's reception, she attempted to engulf the cyclopean member of the Death Squad before being battered away. At Hybalea's urging, the renegades stood down when confronted by Firelord, and Hybalea convinced Firelord to spare them. The renegades vowed to continue working to take down those corrupt Centurions who still served Ravenous and/or ruled worlds under his guidance. She could transforming herself into an apparently fluid state (I initially thought it was sand-or-dust, but it looks like bubbles in some images) and presumably would have powers akin to Hydro-Man (Morrie Bench). Apparently her head +/- upper body may remain solid enough that it can be struck, knocking her away from someone or something that she is trying to engulf. While some other members wore a helmet in space to provide them with an artificial atmosphere, this did not appear to be necessary for her. Note: See also the text on Torrent regarding possible confusion over which character is Torrent. After the renegades were exposed while infiltrating Smyt's reception, he closed on Smyt and the Death Squad, but was punched back by the cyclopean Death Squad member who then prepared to batter this guy further. At Hybalea's urging, the renegades stood down when confronted by Firelord, and Hybalea convinced Firelord to spare them. He had a pair of spiked maces in place of each hand (it is unrevealed whether he can turn them back into hands) and also had a number of spikes across the rest of his body. It would seem logical that he had some degree of superhuman strength and durability, but neither ability was clearly confirmed. 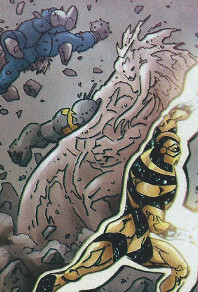 Following Smyt and the Death Squad's apparent deaths, this character is seen in space (see the main image) and looks to be wearing some sort of space helmet, perhaps indicating that it required an atmosphere to breathe, but could otherwise survive in the frigid vacuum of space. See also the main image for another view of him, as well as the two images on the right side of the liquid members sub-profile for him getting a beat down by the cyclopean guy. After the renegades were exposed while infiltrating Smyt's reception, he closed on Smyt and the Death Squad, but was swiftly shattered with a single blow by the cyclopean Death's Squad member. Following Smyt and the Death Squad's apparent deaths, the Centurions kept his remains (and the liquid renegade was holding his head) as they were confronted Firelord. He did not have the chance to demonstrate any special abilities. As he appeared mechanical, it may be that he could be rebuilt. Note: See the image in the main history for a clearer image of his upper body, at least, as well as the main image for his shattered form. He is also clearly visible in the main image for the Centurions profile and the first image on the left of the Centurions profile. As I finished up the Centurions profiles, it became very clear that this guy had similar shoulder pads, hands, and circular cheek-bone-area markings as Praxagora. As she is from a robotic species from the Negative Zone, it seems quite likely that this guy is from her race, the Ataraxians. 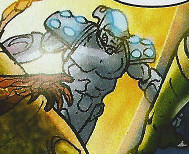 After the renegades were exposed while infiltrating Smyt's reception, this character closed on Smyt and the Death Squad, but was rapidly put on the defensive, projecting a force field when the visor-wearing Death Squad member fired upon him or her (as seen in the far right image for the liquid Centurion). He could apparently form a force field 360 degrees around his form that could protect him from outside assaults. Note: See the image in the main history for a clearer image of his upper body, at least, as well as the main image him wearing his space helmet. The right-most image in the liquid Centurion's sub-profile shows him forming his force field.